Congratulations, Jordan, and welcome new board members! The Alumni Board is a group of dedicated volunteers who lead alumni engagement efforts and serve as conduits between the on-campus and off-campus Pomona communities. To see the roster of current board members and learn how to get involved, visit www.pomona.edu/alumni/alumni-association-board. Ever wish you could go back to class? The new Ideas@Pomona program curates the best academic content from around campus and the Pomona community to ignite discussion, share ideas and highlight daring research. To take part, join the Ideas@Pomona Facebook group at facebook.com/groups/ideasatpomona. Not a Facebook user? Check the Pomona College YouTube channel for videos and watch your email and this bulletin board for updates on development of a web-based home for Ideas@Pomona content. To join the Book Club and access exclusive discussion questions, faculty notes and video content, visit www.pomona.edu/bookclub. 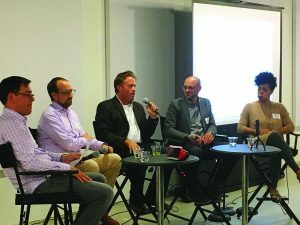 Pomona College Career Connections kicked off its year of programming at Claremont Graduate University’s downtown LA campus on September 27 with a panel of Sagehens discussing careers in advertising, digital media and virtual reality. Panelists included Paulette Barros ’11, Wayne Goldstein ’96, Jeremiah Knight ’94, Bill Sewell ’95 and Matt Thompson ’96. The Pomona College Career Connections program fosters meaningful relationships for Sagehens in their professional lives and provides opportunities for volunteers to help current students as they discover different career paths. To learn more about the Career Connections program and events, visit www.pomona.edu/alumni/careerconnections. 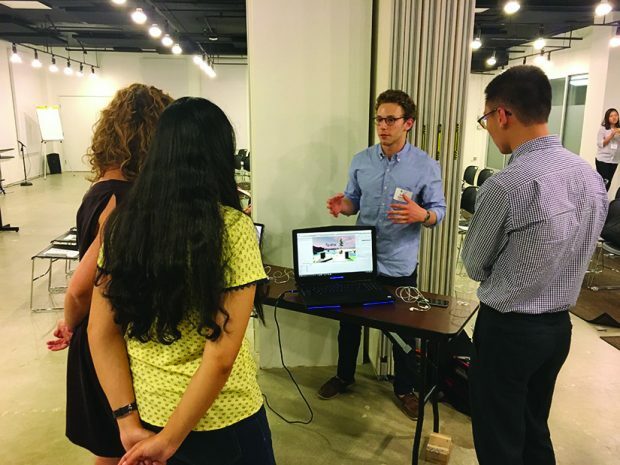 Avery Bedows ’19 demos technology from his virtual reality startup Altar Technologies, Inc.
Give your gift and tell us why you are committed to Pomona at www.pomona.edu/give.